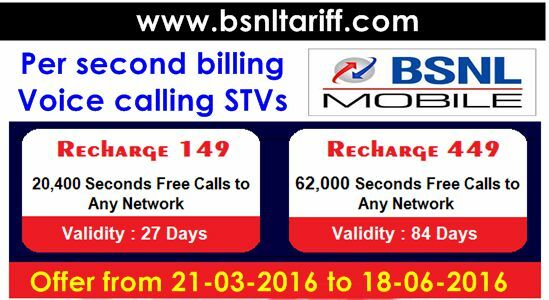 BSNL Mobile has announced extended offer on Per second billing voice calling STVs of Rs.149 and Rs.449 under Prepaid plans mobile services. State run Telecom Company Bharat Sanchar Nigam Limited (BSNL) Kerala Telecom Circle Competent authority has decided to extend offer announced earlier on Per second billing voice calling STVs of Rs.149 and Rs.449 for further period of 90 days from 21st March, 2016 onwards for Prepaid plans mobile users. As per latest information, BSNL on receiving good feedback from various units and from customers of Kerala Telecom Circle has extended the promotional offer on Voice STV 149 and Voice STV 449 which features, Free voice seconds to any network. Promotional basis introduced Voice STV of Rs.149 offers, 20,400 Free voice seconds for both Local/STD to any network comes with validity for 27 days. As well, Voice STV of Rs.449 offers, 62,000 Free Voice seconds for both Local/STD to any network comes with validity for 84 days. Prepaid Customers can activate the above STVs through using USSD code by sending from mobile as STV VOICE149 to 123. The above Voice calling STVs extended offer will be implemented from 21st March, 2016 and available upto 18th June, 2016 across Kerala Telecom Circle for Prepaid plans mobile users as promotional offer basis for a period of 90 days.